Lets go “To infinity … and beyond!” with the ARC Soldier custom minifigure by Amadgunslinger. This is a great use of the Lego Buzz Lightyear winged jetpack and the paintwork is amazing. The red button detail really stands-out and the helmet and goggles match nicely. The inclusion of the weapon and cartridges make a great a great photograph. This is one of my favourite custom minifigures – well done! Call of Duty Modern Warfare 3 Delta Force Minifigs by Amadgunslinger are taken from the first-person shooter video game Call of Duty: Modern Warfare 3. Mission objectives vary in their requirements, ranging from having the player arrive at a particular checkpoint, to eliminating enemies in a specified location, to standing their ground against enemy squadrons, manning mini-guns and other weapons, and planting explosive charges on an enemy installation. From Left to Right: Truck, Frost, Grinch, and Sandman look incredible. The colour co-ordination of the vests is spot on and the camouflage of the helmets is very good. Even the face decals are excellent. 1. what first got you into custom minifigs? Well I guess about three years ago I ran across the website “MOCpages” and after some exploring on there I found some pretty cool custom minifigs. So after that I put my art skills to the test to try my first custom minifig, and ever since then I have been quite fascinated by custom minifigs. 2. You’ve done all sorts of customizations from decals, to sculpting and painting, what would you say is your favorite aspect, why? what about your weakest points? 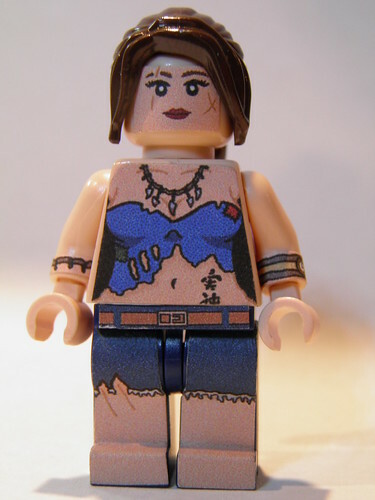 do you think you’ll try other aspects of minifig customization? Well my favorite aspect would have to be the sculpting, I think that sculpting takes the most creativity which I really enjoy. My weakest point is probably decal making. I enjoy making decals but, I don’t have the fanciest program like Roaglaan has, but I still have fun with what I got. 3. For a newbie, do you think theres any good advice you can give them? Everyone! Use your imagination! I have people ask me, “where should i start” or “what should i do”, so if you put your mind to it, anything is possible!!! 4. Where do you get your ideas for your creations? Mainly from movies and video games. 5. How do you feel the lego collectors series has affect the custom minifig community, do you think its affected your style? do you think its given custom minifigs a greater acceptance and exposure in the wider lego community? I think the Collector Series has in some ways affected the custom minifig community, especially in some of my figs. Yes I think it has given custom minifigs a better acceptance in the Lego world. 6. Are there any customized you feel have particularly inspired you or you look up to? why? I have been inspired by all of my good friends on flickr, but I think Roaglaan, Pedro-79, Family Bricks, JasBrick, and ShoBrick have had the biggest impact due to their amazing custom work. 7. 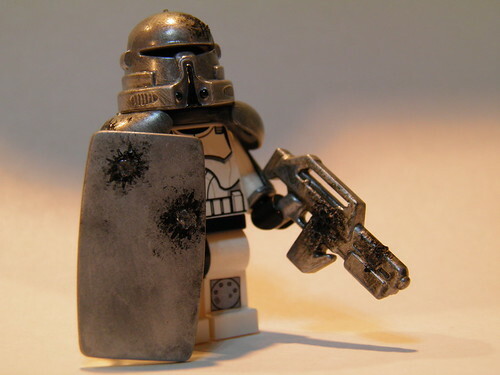 How do you feel about the use of paints and non-lego parts/non-custom house parts on minifigs, do you think its a positive step for the community? how do you feel about purist minifigs? I think that using custom elements, painting, and modding just expands the possibilities of Lego. So yes it is a very positive step for the Lego Community. I have no problem with purist minifigs, but i feel that when you are hoping to create the fig you want, Lego lacks the possibilities that custom figures have. 8. If lego created one set or minifig of your choice what would you choose? why? That’s a hard one, but if i had one choice it would have to be a Cloud Strife minifig from Final Fantasy VII. The reason for choosing Cloud Strife is because he is the main character in my favorite RPG game series. 9. Is there a particular minifig that you wish you had created? Not that I can think of, but I am always open to new ideas. I want to give a shout out to all my great friends on flickr! really like the gun shot scarring on the brickforge shield and brickarms gun, painting these parts chrome was nice, but the custom minifig kind of lacks detail as a result. really awesome custom minifig, the design of these decals is superb, love it. 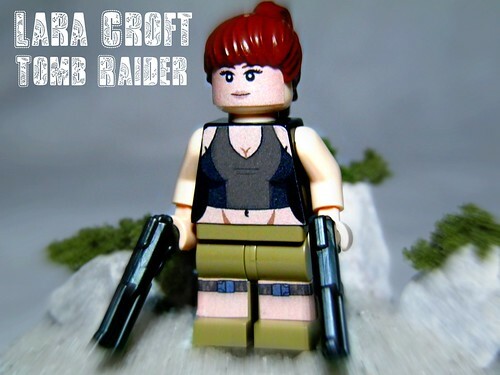 this custom minifig is a character form a brickfilm by Amadgunslinger. Sarah meets Axel when he come looking for help after being left to die in the desert.